Nausicaa: Of the Valley of the Wind, is a movie written, directed, and animated by Hayao Miyazaki, a Japanese filmmaker and artist. 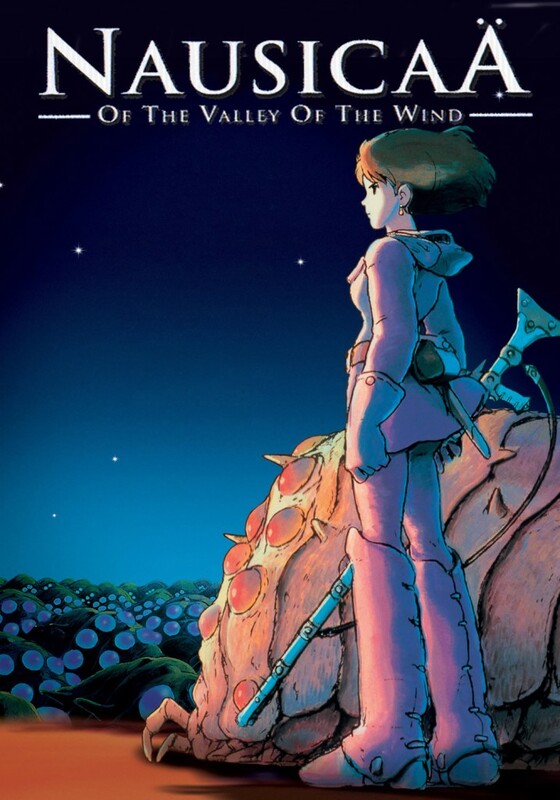 This movie focuses on Nausicaa and her kingdom, the Valley of the Wind. A thousand years after a war that devastated the Earth, humanity lives in small, secluded kingdoms. Outside the kingdoms, the Earth is being consumed by a Toxic Jungle guarded by huge insects. The Toxic Jungle got its name from the fact that the plants in it shoot out poisonous spores and gasses. Anything other than the giant insects that live in the jungle – whether it is animal or human – which should be unfortunate enough to enter the jungle without a mask will be dead in five minutes. Nausicaa is the princess of the Valley of the Wind and the heroine of the film. The Valley of the Wind is a peaceful kingdom by the sea. The winds from the ocean protect the valley from the Toxic Jungle’s poisons and spores. However, people in the valley are not immune to the same sickness that plagues all the remnants of humanity. Living in proximity to the Toxic Jungle means that, inevitably, some of the jungle’s poisons slowly kill the people who live near it. The disease brought on by the jungle’s poisons leads to paralysis, turning the body “hard as rock,” and it eventually kills the person who receives the sickness. Nausicaa’s father, King Jil, is suffering from this illness. Nausicaa is a kind and loving girl with a special sensitivity to nature. She can communicate with the insects in the jungle and calm their wild rages whenever someone outside or – rarely – inside her kingdom is idiotic enough to do damage to the jungle or kill an insect. Any such action brings swift retribution from the biggest, most impressive – and most dangerous – insects in the jungle: the enormous Ohmu, or Ohm for short. Everyone in the Valley is Nausicaa’s friend. Though they all readily defer to her, and typically call her “Princess,” it is clear that Nausicaa is well-beloved by her people because she loves them. She speaks easily to them and their welfare is her top priority. She does enjoy her trips into the Toxic Jungle on her glider (which is a very cool method of transportation that I want very badly! ), and learning the ways of the jungle and the insects. But in the end, it is her people whom she cares for the most. I saw Nausicaa when I was fifteen, and I was immediately impressed by three things. The first thing I enjoyed about the show was the animation; Miyazaki is well known for his animated features, and Nausicaa shows the world why. The vistas, the clouds, the jungle, Nausicaa and her people – all are rendered in stunningly beautiful detail in the hand-drawn frames. CGI has nothing – absolutely nothing – on hand-drawn animation of this caliber. It is too bad animated shows are no longer rendered so well. The second thing that impressed me came in the first ten minutes of the film. An old friend of Nausicaa and her father, Lord Yupa, returns to the Valley and is greeted happily by the inhabitants. Nausicaa is busy repairing a windmill as the Valley people excitedly ask Lord Yupa for news and express their joy at his return. Then Nausicaa goes down from the windmill and leads a new mother to Lord Yupa. Nausicaa herself is carrying the woman’s baby daughter, the only child born in the Valley in one year! The fact that only one baby was born in the Valley is astounding; and the small, seemingly inconsequential detail that it is the biggest news in the kingdom in a year shows how hard it is in the world of this story for people to have children anymore. Compared to today, where the lives of children are thrown away, this idea of children being precious is very timely. This brings me to the one thing that weighs down Nausicaa: the film is very insistent that humanity has lost touch with nature. Two other kingdoms in the movie, the Tolmekian Kingdom and the land of Pejite, stand in for humanity’s “wanton” brutalization of nature. The Ohmu and the jungle represent nature which, when attacked, fights back violently. The Kingdom of the Valley is set up so that it shows humans living in relative harmony with the Toxic Jungle and the insects. The Valley residents do not have to fear the jungle’s poisons, and so they have never tried to burn or chop it down. This means that the Ohmu have left them alone and, in some odd way, respect them. In return, the Valley residents avoid bothering the jungle at all costs. They instead try to understand the jungle, how it came about, and how to live with it. Nausicaa’s sensitivity to the Earth and nature is part of this theme. The whole reason she can communicate with the Ohmu and calm the other insects in the jungle is not only a result of her study of the jungle and the insects. It is a result of the fact that she is in tune with nature. This theme is heavy in the story and makes it hard to watch sometimes. But the film does have its saving graces. As I mentioned above, there is a third thing which impressed me. Later in the movie, a leader from Pejite informs Nausicaa that he has men luring Ohmu into the Valley of the Wind. He is doing this to destroy the Tolmekians who have invaded the Valley after invading Pejite. He is also doing this to secure a weapon which may destroy the Toxic Jungle and its insect guardians. Nausicaa is horrified by his barbarity. She goes so far as to break down into tears at the thought of the outrage: that this man would lure the insects into an innocent kingdom and destroy its people, as well as the unsuspecting Ohm which are being used, essentially, to get revenge on Tolmekia. Nausicaa’s statement sums up what is really going on in the world today, that one thing or another – nature, healthcare, or some other faux ‘good’ – is being used to give moral credence to outright murder and savagery. This tendency to put nature over humanity weakens the movie’s potential but it does not utterly destroy the story. I think it would have served Miyazaki better if he had placed the story on another planet humanity was trying to colonize, but as the film stands, it is enough to pass the time enjoyably. And yes, I still think the animation is unbelievably beautiful! 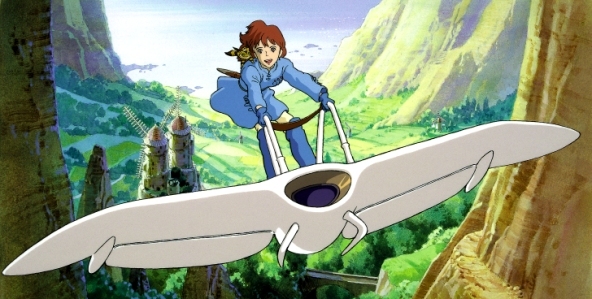 And I STILL want Nausicaa’s glider! Hey, science geniuses! Get busy and design this thing! For heaven’s sake, somebody had better start producing these things! I tell ya, there IS a market for them out there! This entry was posted in Movie Reviews and tagged Alison Lohman, Chris Sarandon, Edward James Olmos, Frank Welker, Hayao Miyazaki, insects, Japanese Anime, Japanese movies, Jodi Benson, kingdoms, Mark Hamill, Movie Reviews, nature, Nausicaa of the Valley of the Wind, Patrick Stewart, poisons, princesses, Shia LaBeouf, Toxic Jungle, Uma Thurman on October 16, 2015 by The Mithril Guardian.